Bigger isn’t always better. In fact, the growing trend in pharma is looking at ways to shrink the industry’s plant-floor footprint down. A few months ago, Amgen announced plans to build a new “next-generation” manufacturing facility in Rhode Island, which will be modeled on the company’s highly innovative plant in Singapore. What makes it cutting edge? Its smaller size. According to Amgen, its Singapore facility occupies about one-fifth the size of a traditional pharma plant but maintains a comparable level of output. It was also built in half the time and at a fraction of the price of a conventional plant ­— a new measure of efficiency Amgen intends to replicate in the U.S. In the last few years, other pharma companies have followed Amgen’s lead and have been thinking outside of the big box when building or revamping their manufacturing spaces. On the surface, the environmental and cost benefits are clear. In aseptic processing in particular, every square foot can be a major expense and the less floor space there is to keep free from contaminants, the more a company saves. Amgen Singapore Next Generation Biomanufacturing Manufacturing 10Inside Amgen’s next-generation biomanufacturing facility in Singapore. Rethinking the way space is used is also helping companies increase their level of flexibility — a new must as the industry shifts from manufacturing medicines on a mass scale to meeting the rising need of making small batches of personalized therapies. But there could also be wider implications for companies looking for and successfully finding ways to make manufacturing more compact, flexible and mobile. And the industry is far from done scaling down. “Our vision is that one day, we can manufacture medicine in a space as small as this stage,” Arleen Paulino, vice president of site operations at Amgen’s Singapore facility, said earlier this year during a keynote presentation at the PDA Annual Meeting in Orlando. If successful, the ability to make medicine using less space could change the way it is distributed around the globe. What is allowing pharma companies to squeeze into tighter spaces? And just how small could we go? Many in the pharma world are on a quest to find out. It’s tempting to call the trend of going small “downsizing,” but Maik Jornitz, the president of G-Con Manufacturing, has a more accurate term. According to Paulino, improving cell development was a major stepping stone for Amgen’s goal of reducing its footprint. Advances in cell development made in the last 10 years have allowed companies to grow cells faster and express proteins for medicines in a more efficient way. These improved efficiencies mean that companies can now reduce the size of the bioreactors inside their facilities. Instead of stainless steel tanks built to hold 15,000 liters, companies can now use 2,000 liter tanks. Thus, advances in equipment technology have also been critical for achieving the goal of reducing manufacturing space. Single-use systems have been widely embraced by the industry thanks to the boost in efficiency and ease-of-use disposable parts provide. They can also be major money- and space-savers. “The adoption of single-use process technologies not only enables faster production turn-around schedules, but also a major reduction in the utilities size. Single-use equipment avoids high water and energy consumptions, as cleaning processes and the need for copious amounts of water for injection are avoided, and steam sterilization is replaced by pre-sterilization of equipment,” Jornitz says. 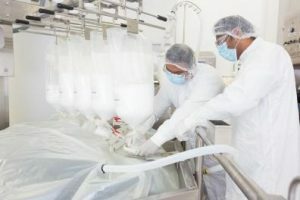 All told, Paulino says about 95 percent of the contact surfaces the products touch in Amgen’s Singapore plant are single-use systems, including disposable plastic bags in its smaller bioreactors. Removing the clean-in-place processes also allowed Amgen to create an aseptic system that is more closed, which reduces contamination risks. “When you’re operating in a way where you’re not opening your connection or your product flows to the environment and it’s in a closed manner, it helps protect your products,” Paulino says. Since Amgen began production at its Singapore plant in 2015, several other companies have realized the benefits of going small. According to Jornitz, the trend isn’t limited to biomanufacturing and several companies have been looking at ways to make oral solid dose production more efficient with continuous processing modes. But in an aseptic processing environment, the payoff is especially large, as robust containment is a must. One of the biggest cost factors in an aseptic environment is air flow — as an ISO 5 environment demands up to 480 air changes an hour. Naturally, if you’re operating in a smaller space, you don’t need to run a high air volume to reach the required air changes to maintain the same cleanroom classification, which saves energy costs. Amgen Singapore Next Generation Biomanufacturing Manufacturing 3Inside Amgen’s next-generation biomanufacturing facility in Singapore. Even in facilities producing bigger batches of medicines, Starkman says many companies are starting to see the value in running multiple small machines instead of a single large production line. According to Jornitz, many of the companies who come to G-CON Manufacturing — which produces prefabricated cleanroom systems called PODs — are looking to shrink their footprint while quickly scaling up operations. The trend is intensifying as more companies work with personalized medicines to fight cancer and rare diseases. In fact, with thousands of gene therapies in clinical trials, that segment of the industry is now the second largest class of medicines being developed — second only to traditional new chemical entities. “The largest number of inquiries we get at G-CON is on the cell gene therapy side, as the autonomous air handling of our PODs guarantees robust containment,” Jornitz says. Containing the biomanufacturing process to a small space is not only good for the pharma company, it’s safer for patients. At Amgen’s Singapore plant, some of the benefits of a smaller space have come from the facility’s unique “ballroom” design. Traditionally, the different parts of operation — from the cell culture phase through to purification — are done in separate rooms. But if you stand on one end of Amgen’s Singapore facility, you can see all the way across the plant — from the bioreactors to purification. The change has also given the company an advantage in how it manages workers. One benefit is that employees don’t have to frequently un-gown and re-gown as they move into new rooms, which saves time and space. But the ballroom design has also shifted the way employees interact with the manufacturing process. Shrinking manufacturing isn’t for everyone. Although many companies are looking at ways to reap the benefits of producing in a more compact space, there still has to be some cost/benefit analysis to make sure it’s a good fit for your operations. “The end game is that form has to follow function,” Starkman cautions. When working with companies to design their spaces, Starkman says they always consider the tradeoffs between stainless steel versus single-use, the cost of utilities, air monitoring and all the other cost factors of running a plant. Despite the many advantages of single-use systems, they don’t automatically translate into space savings. In fact, Jerome Pionchon, an engineering expert with the bioreliance solutions organization at the Merck unit in Martillac, France, says that switching their plant to mostly single-use systems didn’t translate into significant space savings. “When you use single-use systems, you don’t need to use clean-in-place anymore, but you need to store the disposable parts and need more storage space. It’s just a different way to manage the facility,” Pionchon says. Although Pionchon says that single-use doesn’t automatically mean that a company can downsize its facility, it has improved efficiency at the Merck plant in Martillac. There are also challenges to thinking small. At Amgen, Paulino says the company has had to transition its relationships with equipment suppliers to be more like partnerships. What’s it going to take to shrink biomanufacturing to the size of a stage — or even smaller? For Amgen, Paulino says that improving its current systems will help reduce its manufacturing footprint even more. According to Starkman, robotics could also play a role, especially as they become more intuitive and capable of handling multiple tasks. The more functionality we can get from a single robot, the less space manufacturers will need to operate them. Advances in continuous biomanufacturing could also be a game-changer. “With continuous processing bioreactor volumes and downstream processing, footprints can be further reduced. Certainly, media and buffer volumes increase, but also the preparation technologies in this area are evolving,” Jornitz echoes. “Quite a few biomanufacturers are pursuing continuous manufacturing, which can help them shrink that facility footprint even further. “Major advances in the field of antibody boosters need to be accelerated. The hope is that in five to 10 years, designs of more mobile, rapidly deployable bioprocessing spaces are available to fight any potential pandemic threat,” Jornitz continues. That solution could prove to be especially needed as the threat of the next global health crisis looms. For example, in May of this year, the World Health Organization reported that Ebola is back and several cases have been confirmed in the Democratic Republic of Congo (the disease claimed more than 11,000 lives between 2014-2016 in West Africa). The fresh outbreak has already killed dozens and health officials are scrambling to contain it before the disease spreads again. Currently, one of their chief weapons of defense is a new experimental vaccine created by Merck, which has been approved for “compassionate use” in outbreaks even though it has not yet been formally given the green light by any regulatory body. But because the new cases are in very remote areas, maintaining the cold chain to transport thousands of vaccines where they’re needed has been a concern. Mobile manufacturing could change that. “My dream is that four trucks drive into a warehouse anywhere in the world,” Jornitz says. “One truck is utilities, like chilled water, electricity etc. The other two trucks are cell-based drug substance processing spaces, and the last truck is for final dosage formulation and filling. With that you could produce vaccines wherever they are needed.